Organise or Die ? 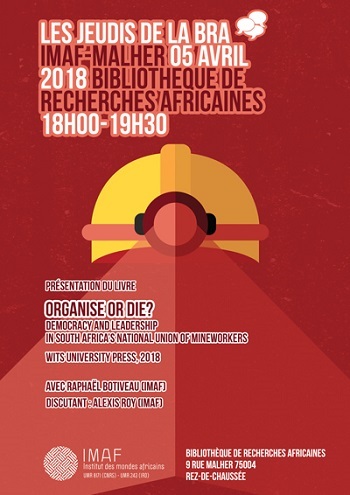 Democracy and Leadership in South Africa’s National Union of Mineworkers is the first in-depth study of one of the leading trade unions in the country. Founded in 1982, the trade union played a key role in the struggle against white minority rule, before turning into a central protagonist of the ruling Tripartite Alliance after apartheid. Deftly navigating through workerist, social movement and political terrains that shape the South African labour landscape, this book sheds light on the path that led to the unprecedented 2012 Marikana massacre, the dissolution of the Congress of South African Trade Unions (Cosatu) federation and to fractures within the African National Congress (ANC) itself. Working with the notions of organisational agency and strategic bureaucratisation, Raphaël Botiveau shows how the founding leadership of NUM built their union’s structures with a view to mirror those of the multinational mining companies NUM faced. Good leadership proved key to the union’s success in recruiting and uniting mineworkers and NUM became an impressive school for union and political cadres, producing a number of South Africa’s top post-apartheid leaders. An incisive analysis of leadership styles and strategies shows how the fragile balance between an increasingly distant leadership and an increasingly militant membership gradually broke down. Botiveau provides a compelling narrative of NUM’s powerful history and the legacy of its leadership. It will appeal to a broad readership – including journalists, students and social sciences scholars – interested in South Africa’s contemporary politics and labour history.